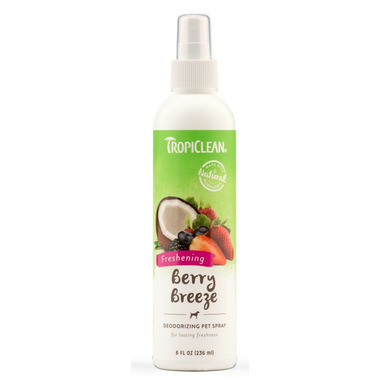 TropiClean Berry Breeze Deodorizing Pet Spray adds extra freshness to your pet’s coat after bathing or between baths. In addition to giving your pet a signature scent with a tropical fragrance that lasts for days, Berry Breeze conditions your pet’s coat and reduces static. Directions: Spray on entire animal except eyes, if odour remains please re-spray. Ingredients: Purified water, organic blend of (raspberry extract, pomegranate extract, aloe extract, blueberry extract, mango extract), odor neutralizer, fragrance, hydrolyzed plant protein, vitamin E.